Soon after William Golding’s book Lord of the Flies was published in 1954, Ealing Studios bought the film option, but it soon became apparent that they would never make it and sold the rights to producer Sam Spiegel. He hired the experimental theater director Peter Brook, who had done innovative productions of Salome and Marat/Sade. Brook wanted to remain faithful to the source material while Spiegel hired several screenwriters to make it more commercially viable. Fortunately, Brook’s version won out and he made it with untrained child actors on a low budget, utilizing an improvised style of filmmaking. 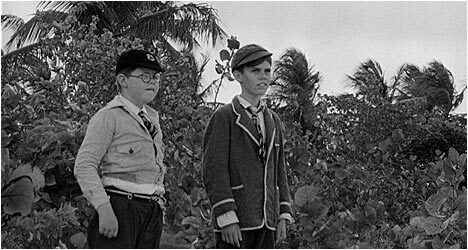 Lord of the Flies (1963) begins with a powerful montage of stills depicting life at a British boarding school and how the outbreak of war causes the evacuation of its students. When the plane carrying them crashes into the ocean, the survivors make their way to a nearby island. We first meet Ralph (Aubrey) and Piggy (Edwards), the latter a slightly pudgy asthmatic, on a beach. They find a conch shell and when Ralph blows on it several other surviving students show up. Included is a group of boys from another school, led by a confident lad named Jack (Chapin). They are introduced with a striking image of them wearing formal school outfits marching purposely along the beach. Realizing that there are no adults around to govern them, the boys decide to take matters into their own hands with Jack and Ralph as the self-appointed leaders. It doesn’t take long for the kids to adopt a tribal mentality, first suggested in the scene where Jack and his hunters stalk and kill a pig, eerily foreshadowing Simon’s (Gaman) fate. The rest of the film depicts their descent from civility to savagery. Brook adopts a documentary style, which is enhanced by the cast of young kids that lack the polish of professional actors, adding to the realism. They come across as actual kids having to fend for themselves. That being said, the main characters represent specific ideologies with Piggy being the intellectual, Ralph is his rational, level-headed friend, and Jack is the aspiring fascist dictator that uses fear to keep the other boys in line. This shows the move away from the early democratic stance that the boys adopted into a brutal example of social Darwinism where only the strong survive and the weak, like Piggy, are punished. Brook does a brilliant job of capturing the spirit of Golding’s novel by utilizing much of its prose. The choices he makes in terms of camerawork and music is daring and helps create a believable atmosphere, drawing us into this absorbing drama. The story of Lord of the Flies is meant to be a metaphor for society and warns of the dangers of mob mentality, how easily people can be swayed, even bullied by a charismatic personality. Obviously, the film takes things to an extreme, but this does little to dilute its powerful message. Supervised by cameraman Gerald Feil, this new Blu-Ray transfer looks great, with excellent contrast and sharp detail to the image without taking away from inherent grain of the film stock. There is an audio commentary by director Peter Brook, producer Lewis Allen, director of photography Tom Hollyman, and editor Gerald Feil. Allen, Hollyman and Feil point out that they had little to no filmmaking experience when Brook asked them to work on Lord of the Flies. He wanted inexperienced collaborators to give the film a unique look. The director talks about what drew him to the project and his approach to it. This is an excellent track as the participants share anecdotes about the novel approach they took to making the film. “Novel Reading” is a 1977 Random House recording featuring William Golding reading from his novel over select scenes from the film. It is always interesting to hear an author read their own work. “Behind the Scenes” is a collection of home movies, screen tests, outtakes and stills from Lord of the Flies with commentary by Brook, Allen, Hollyman, and Feil. They provide insights into how the film was made, including creative choices. They also talk about how they learned the basics of filmmaking shortly before principal photography began. Also included is a deleted scene taken from the “Huts on the Beach” chapter in the novel and can be viewed either with its original soundtrack, with commentary or with a reading by Golding. It sheds more light on the relationship between Jack and Ralph. There is a 30-minute interview with Peter Brook conducted in 2008. He talks about his take on Golding’s book and his approach in adapting it. He also talks about getting involved in the project and delves into the challenging production in this informative extra. “The South Bank Show: William Golding” is a 25-minute excerpt from the November 16, 1980 episode. It examines his life, takes a tour of the town where he grew up and takes a look at three of his novels, including Lord of the Flies. Golding comes across as a charming, smart fellow in this fascinating interview. There is an interview with cameraman and editor Gerald Feil. He talks about getting involved in the film and also discusses some of the technical aspects of making it. Feil points out that they didn’t have a screenplay and instead used the book while making it. “The Empty Space” is a 16-minute excerpt from Feil’s 1975 documentary examining some of Peter Brook’s methods as a theater director. He talks about his philosophy towards the theater and among his troupe is a young Helen Mirren! Finally, there is “Living Lord of the Flies,” an excerpt from some of the 8mm camera footage shot by the young actors while making Lord of the Flies. Tom Gaman, the actor who played Simon, reads from his personal recollections of making the film.